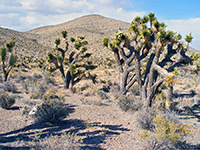 Running for 50 miles along the west edge of Las Vegas, the Spring Mountains mark the start of Nevada's Great Basin Desert, characterized by tall, narrow, ridges separated by wide, empty valleys, and differing from the Mojave Desert to the south in that the temperatures are lower, average elevation higher and annual rainfall greater. 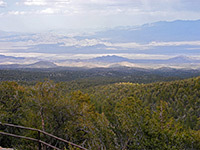 All such mountains are well separated from neighboring ranges by the much lower and more extensive desert land in between, and so harbor distinct plant and animal life, as well as containing a variety of climate zones in close proximity; both these aspects are illustrated by Mount Charleston, the highest summit of the Spring Mountains (11,918 feet), whose foothills may be reached by an easy half hour drive from downtown Las Vegas. Although not particularly spectacular to look at - certainly not in the same league as the rocky summits of Colorado or California - Mount Charleston receives many visitors each year, who come for hiking, picnicking, photography, skiing (November to March), or just to escape from the heat below. The temperatures at the highest points reached by road (around 8,000 feet) are usually 15 to 20°F lower than in Las Vegas Valley, with the summit another 10°F below this. Las Vegas provides every type of accommodation, and while there are a few closer places along US 95, most are around downtown, or to the south and east. Mount Charleston Village contains one lodge, offering 23 log cabins, set in pine forest right at the western end of Kyle Canyon Road. Roads NV 156 and NV 157 climb into the Mount Charleston foothills, and are linked by NV 158 across the eastern slopes, together forming a 54 mile loop (including part of US 95). Two short spur roads lead a little way higher up, ending at Mount Charleston Village and Lee Canyon, site of the ski resort. 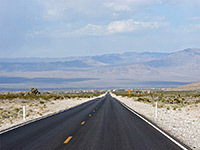 NV 157 (Kyle Canyon Road) is the most used approach since it is closer to Las Vegas; this first passes scattered residences and quite a lot of new development then enters emptier land, winding up a shallow canyon studded with Joshua trees typical of the Mojave Desert at this elevation (5,000 feet). These fade away as the road continues to climb, replaced by small bushes and eventually pine trees, as the road crosses the boundary of the Humboldt-Toiyabe National Forest. Once past the last of the houses there are plenty of sandy side roads leading into the desert or the woods, good for hiking or (free) camping. 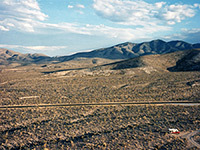 The northern approach (NV 157; Lee Canyon Road) traverses even less developed land but has similar scenery on its 16 mile, 5,600 foot climb up a long slope into the mountains. The top parts of Mount Charleston and adjacent peaks are formed from bare, jagged limestone, rather dull gray in color, while the slopes beneath are quite steep, and densely forested with several types of oak, pine and fir, including large strands of ancient bristlecone pines. 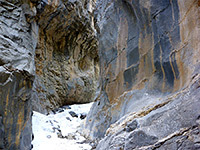 Rocks are also exposed in many places lower down, forming steep ravines and tall cliffs, occasionally with small caves eroded at their base. A number of larger canyons drain the mountain slopes and carry streams most of the year, some producing impressive waterfalls. The scenery is pleasant and unspoilt, though the hills are not really different to dozens of other, less accessible, peaks in Nevada; it is the proximity to and easy access from Las Vegas that makes Mount Charleston so popular. 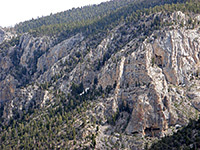 The best viewpoints in the Spring Mountains, together with many of the trailheads and picnic areas, are along the 9 miles of NV 158 (Deer Creek Highway), connecting the two entry roads. At Desert View, reached by a very short path, a huge area of the valley far below can be seen, framed by distant peaks of the Sheep and Las Vegas ranges, though such long-distance outlooks are often partly obscured by haze and pollution. Nearby is the Hilltop campground, one of six main camping areas, again with nice views of desert lands to the east. Just south of here, a short path leads along a narrow, shady canyon to Robbers Roost Cave, quite a large opening in the limestone cliffs. More trails start along Kyle Canyon Road around Mount Charleston Village, most strenuous being the 8.3 mile hike to the summit itself, along the South Loop Trail. Other good routes hereabouts are the 1.2 mile path to seasonal Mary Jane Falls (with an optional side trip, partly off-trail, to nearby Big Falls), the relatively easy 2 mile hike along overgrown Fletcher Canyon to an impressive limestone narrows section, and the steep, 2 mile climb up Trail Canyon. The ski center in Lee Canyon (Las Vegas Ski & Snowboard Resort) has four chairlifts and a longest ski run of 2,000 feet, down the north face of Charleston Peak. The area is quite small and the skiing generally easy, but the center receives a fair amount of visitors in winter, as it is by far the closest ski resort to Las Vegas (45 miles) - the next nearest is Brian Head in Utah, over 200 miles away.